Flex Films, the global film manufacturing arm of Uflex, has launched two new state-of-the-art BOPET films, at its manufacturing centre in Kentucky, USA. 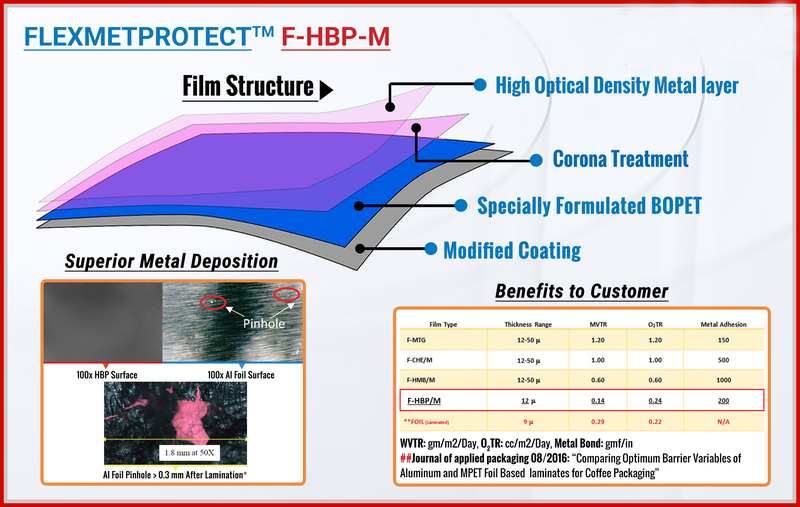 FLEXMETPROTECT F-HBP-M is a metalizedbiaxially oriented polyester (BOPET) film with a superior gas barrier that offers high moisture and oxygen barrier for virtually all applications including aluminium foil replacement. High barrier comes from patented BOPET film technology, with high optical density specifically suitable for most flex pack product offerings. This film is 100% web inspected; using our advanced web metalized surface inspection system. The film is EU and FDA, making it an ideal choice for products requiring foil replacement and extended shelf life with high barrier against oxygen and moisture. It’s especially useful in products that require aroma management like packaging of coffee and others like medicines, snacks, dried meats and nuts. The film will be of great use in shipping moisture sensitive items in multi-layered pouch,” continued Vijay Yadav, on the gas barrier BOPET film F-HBP-M.
FLEXPROTECTTM F-HBP-M Film works as an excellent barrier to gases and water vapour with fewer pinholes as compared to aluminium foil. With the use of aluminium foil being eliminated and the film being recyclable; it makes it highly cost effective with a better yield per unit area. 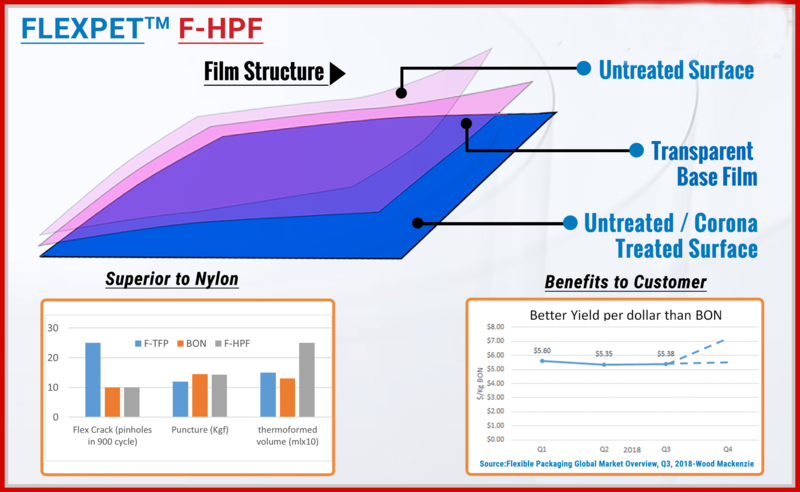 FLEXPETTM F-HPF, which is a first-of-its kind biaxially oriented nylon replacement (BON) film made with a newly developed patent pending technology offers important features of thermoforming performance, high puncture resistance and flexural fatigue strength. This technology is suitable for many applications, thereby providing a replacement for biaxially oriented nylon (BON) in many applications. “The film complies with EU and FDA regulations and is a perfect choice for products that require burst resistance especially in the category of cheese & dairy products, meat, processed meat, fresh & frozen foods and brick packaging, to name a few. The property of thermoformability allows it to mould itself into the shape of item and is of great use in ecommerce packing of 3D objects,” Yadav added. “For ecommerce brands, transporting products in a safe and efficient way is the name of the game. To ensure product quality and safety, flexible packaging is aided by high-barrier film F-HBP-M that works both as a protective oxygen barrier and moisture barrier system. This helps the food products maintain their unique flavors and fresh aromas. In addition to this, our new grade F-HPF provides an extra layer of safety to sharp products that otherwise have a high risk of puncture or damage during shipping and handling process”, Chaturvedi said. F-HBP-M & F-HPFwill be available to its customers from today and will be targeting America and Europe region.